It's lovely to receive a bouquet of roses. There is no flower more suitable for cutting than the rose. Strong, sturdy stems, buds that open slowly and elegantly and the bonus of fragrance, make roses a favorite both to receive and to grow in a cutting garden. Once you bring them indoors, there are any number of ways to display and enjoy them. Handle them right and they will last well over a week. The best time to cut roses is after 3 PM, in the afternoon, when they are highest in food reserves. This will give them the strength they need to last a long time, as cut flowers. Choose rose buds that have visibly begun to open, but that are no more than 1/3 to 1/2 fully open. Tightly closed buds may never open and flowers in full bloom won't last very long. The best cut roses will have just begun to unfurl. It won't take them long to finish the job indoors. Always use clean, sharp pruners to prevent damaging the rose canes and spreading disease. This won't affect your cut flowers, but you don't want to harm the plant in the process of cutting. Leave at least 3 leaves on the stem, to feed the plant. It's a less severe shock to the rose bush if you don't remove the entire stem. This is more important on hybrid tea roses and less of a problem with cluster roses and multi-stemmed roses. Get your roses into the water as soon as possible. Bring a bucket of water with you when you cut. If you cut the roses outside without water, re-cut the stems indoors either underwater or immersed in a bucket of water. Once cut, remove all leaves that would be below the water line. They will just rot, turn the water foul, and possibly rot the stems along with them. Use either a floral preservative or add a splash of a lemon/lime soda or even a squeeze of lemon and a tablespoon of sugar to the water in the vase. Or try a few drops of bleach. You basically want to give them a little food and prevent fungal problems. 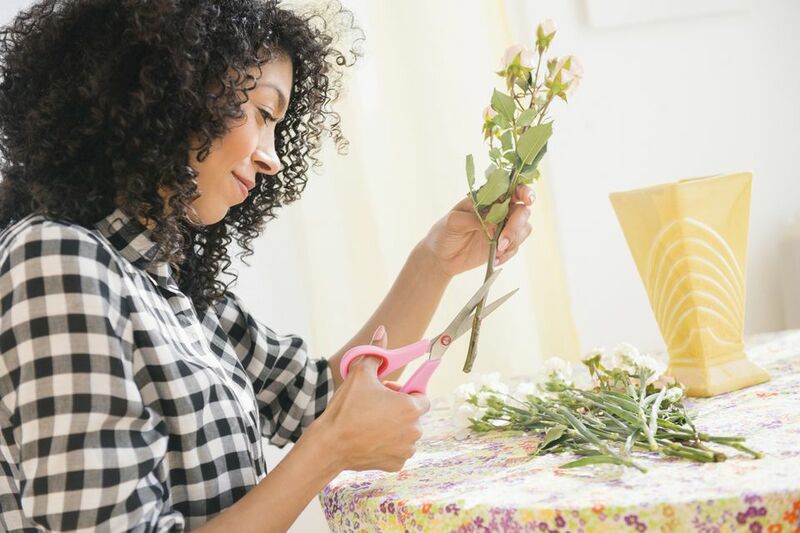 If you cut a lot of flower arrangements, you can buy floral preservative less expensively, in bulk. Let your cut roses have a few hours in a cool spot out of direct sunshine before you display them. This lets them adjust slowly and extends their vase life. Change the water whenever it starts to get murky. This is easy to remember if you use a clear vase. If your roses are in an opaque container, remember to check it daily. If your roses seem to be wilting, it could mean water is not able to flow through the stem. Re-cut the stem bottoms and submerge them in very warm, (not so hot you can’t touch it) water and let them sit for about an hour before replacing them in the vase. This should open their vascular system and let the water rise through the stem. Sit back and enjoy. The only thing better than a vase full of roses is a vase full of roses you grew yourself.